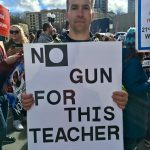 In the wake of the Parkland school shooting–and more than 190 other school shootings since Columbine–people took to the streets on Saturday to call for gun control. Seattle high schoolers organized a local event to take place in conjunction with the Washington D.C. march. The Seattle march was one of more than 800 held world wide. KBCS’s Angie Voyles Askham brings you some voices and sounds from the event.